The French interpretation of an Indian Masala spice blend called vadavam. "Vadouvan" is the French version of a masala blend. It is essentially the same as a standard Indian curry blend but with the addition of aromatics (such as garlic). Other componenets include fenugreek, mustard powder, cumin, coriander and ground fennel. Vadouvan originated during the French colonization of Southern India. This masala curry has a more Western flavor than the traditional Indian curry blend, and the added touch of grated shallots is largely responsible that. Vadouvan is not as turmeric heavy as the curry powder developed in British colonized parts of India. This blend can be used for traditional curry purposes or can be spun a variety of other ways in cooking. Try it in a marinade for seafood or use it for curried chicken salad. 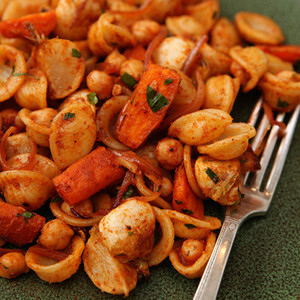 We incorporate it into our Lemon Orecchiette with Vadouvan Roasted Carrots & Turnips for a nice smoky finish.